Please use the form on the right to send an email to Lisa Goddard. Please use this form to join Lisa Goddard's mailing list. Thank you! You have been added to Lisa Goddard's mailing list, and will receive one or two email updates from her each month. We thought the Emergence Quartet's busy week at Avaloch Farm Music Institute and the Society for Historically Informed Performance couldn't get crazier, but it did! 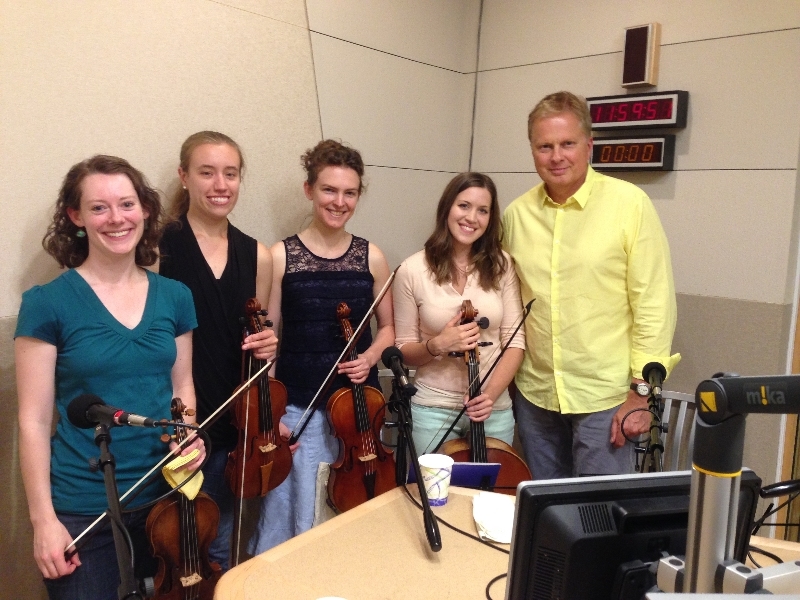 We had the privilege of doing an interview and performance on WBUR, Boston's NPR news station on July 11. The show was On Point, a news discussion show with host Tom Ashbrook (photo above). It was a great chance for us to share our work with a much wider audience than usual. We discussed the history of the string quartet, and illustrated our story by performing some excerpts from our first program. 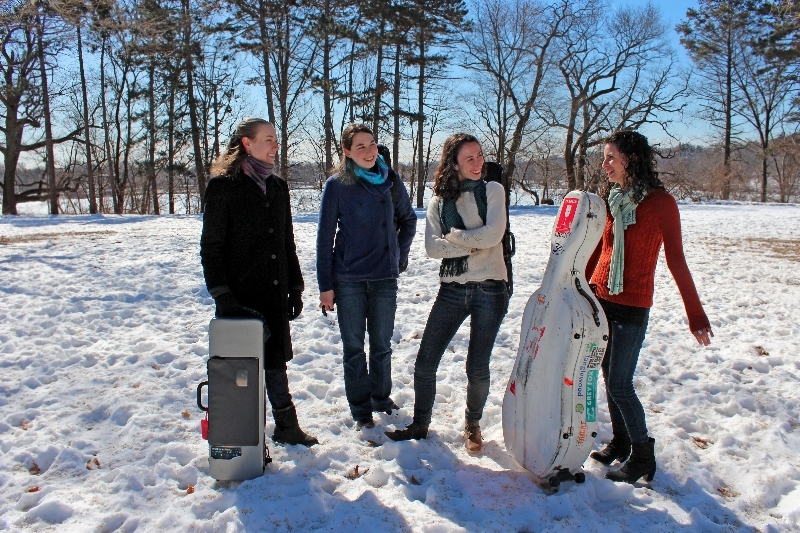 I've got a couple of great chamber music projects happening this week in Boston. I'm playing with my modern quartet, the Cardamom Quartet, at the Boston Public Library in Copley Square on Friday. It is an outdoor concert in the courtyard - so fortunately the weather should be much warmer than our wintry photoshoot (below)! On the program are Schubert's Quartettsatz, Nico Muhly's Diacritical Marks, the Ravel Quartet, and an original by our own Rachel Panitch, who wrote the piece while she was in residence at Zion National Park in April. I also have the privilege of playing period-instrument Haydn with wonderful colleagues, including a fellow Oberlin graduate, Sylvia Berry. A fortepianist, Sylvia recently started the Berry Collective, a flexible early music ensemble. 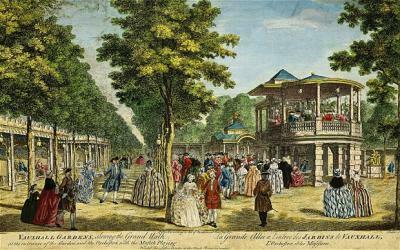 The program for this week is all about the musical life of London. I'm participating in the final work on the program, an arrangement of Haydn's Symphony No. 104 for fortepiano, single strings, and flute. It's a delightful piece, and the arrangement provides an interesting perspective - in the absence of recordings, chamber arrangements of large works were how people experienced symphonies at home.